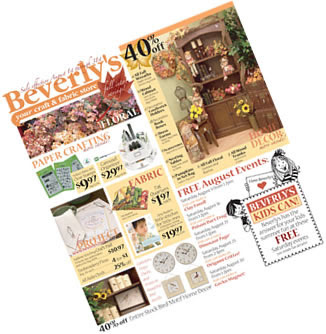 Beverly's Official Blog | News and findings from world of crafts, scrapbooking and more: August already?? .... so that means a new Beverly's circular is out - you can view it on-line here. Did you know when you get a circular in the mail, it has coupons? Didn't get yours? Sign up here. More Coupons ..... August's internet coupon is now on the Beverly's website www.beverlys.com, and this month we're featuring Crystazzi Crystals - use these polished crystals to add some sparkle to your creations! View the coupon here. Need more??? If you're signed up to receive our e-mails, you'll get more. Sign up here.